I discovered the Glutenfreeda web site shortly after our older son was diagnosed with celiac disease. For the last 10 years, the founders of Glutenfreeda have published an online gluten-free cooking magazine with lots of gluten-free recipes and product reviews. More recently, the company's Glutenfreeda Foods division has introduced its own gluten-free products that include ice cream sandwiches made in association with Julie's Organic Ice Cream. 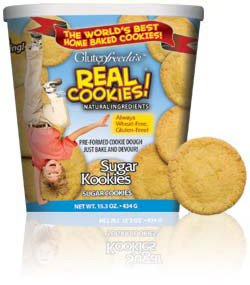 Glutenfreeda Foods' first products were ready-to-bake Real Cookies. Each resealable 1-lb. container has between 12-14 frozen, shaped cookie dough pieces that are made with all natural ingredients and no trans fats. The cookie line includes the following varieties: Chip Chip Hooray, Chocolate Minty Python, Peanut Envy, Peanut, Paul & Mary, Snicker Poodles, and Sugar Kookies. It took me about 20 minutes from freezer to plate to bake the chocolate chip cookies, which were soft and chewy. I also tried the company's gluten-free frozen burritos, which are sold individually and come in four flavors: chicken & cheese, vegetarian bean and cheese, vegetarian and dairy free, and - my favorite - the breakfast style with potatoes, red bell peppers and onions. Like the cookies, the burritos contain all natural ingredients. The easiest way to prepare the burritos are in the microwave oven, but in that case it's likely that you'll have to eat them with a knife and fork rather than by hand. We did not try cooking the burritos in a conventional oven for the recommended 45 minutes but they'll probably come out firmer that way. Glutenfreeda's newest products are three varieties of flavored instant oatmeal, made from certified gluten-free oats. 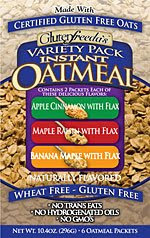 Each single-flavor box (maple raisin with flax, apple cinnamon with flax, and banana maple with flax) contains six packets, while the variety pack contains two of each flavor. These products are not saccharine like many national brands of sweetened instant oatmeal; the natural sweetness of the fruits blends with the added brown sugar to make a mildly sweet hot cereal. I liked the banana maple flavor the best of the three, which I made in a microwave oven using water. The ice cream sandwiches can be found at Whole Foods Markets exclusively through the end of July, after which time they will be available at local natural food stores. The cookies, burritos and oatmeal, which are processed in a dedicated gluten free facility, are available now at natural food stores and online at the Gluten Free Mall.